Bio Turbo, Miatech’s patented technology for removing ethylene and airborne bacteria from refrigerated warehouses, has been adapted for usage in refrigerated trucks and reefers. Since Bio Turbo is an equipment, it doesn’t have to be replaced like regular filters; once installed it can work for years. Bio Turbo uses ozone to remove ethylene and kill organic pathogens, however ozone is only used inside the reaction chamber and never leaves it. Purifying air using the power of ozone while avoiding all of the drawbacks that ozone can potentially have is a patented process developed by Miatech. 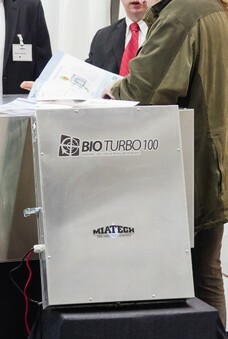 “Our new Bio Turbo 100 for refrigerated trucks was a star of our booth at Fruit Logistica. I only wish we could develop it sooner, in time to nominate it for the Fruit Logistica innovation award” – shared Costas Iconomou, Miatech’s President, Chairman and CEO. The advantages of this technology include small size, ease of connection to reefers’ wiring system, and ease of installation. Bio Turbo is virtually maintenance free, it only requires changing air filter and ozone plates once per year. This procedure is so simple that it can be performed even by individuals without technical training.